Originally published under the title, "Turkey: Where Some Murders Are More Equal than Others." 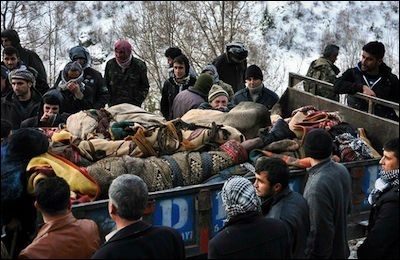 Victims of the December 2011 Turkish air strike that left 34 Kurdish civilians dead. What happens if an army kills Turkish civilians? It seems to depend on which army does the killing. On May 31, 2010, the Israeli Defense Forces raided the Mavi Marmara, the Turkish vessel leading a flotilla in order to "end the illegal Israeli siege of the Gaza Strip." In response, Turkey downgraded its diplomatic ties with Israel and threatened to isolate the Jewish state in an international campaign. Since then, Turkish-Israeli relations have never normalized. Turkey's leaders -- then Prime Minister (now President) Recep Tayyip Erdogan, and then Foreign Minister (now Prime Minister) Ahmet Davutoglu -- not only labelled the incident "a crime against humanity," but they also claimed it was "a cause of war." "Even in a war, you don't attack women, children and religious personnel," Erdogan said in a 2010 speech. Later, it would be a speech Erdogan would prefer not to remember. Exactly 582 days after the raid on the Mavi Marmara, on December 28, 2011, the Turkish Air Force bombed a group of mostly teenage villagers from Uludere (Roboski in Kurdish), in predominantly Kurdish southeastern Turkey. Mistaking them for pro-independence Kurdish terrorists, they killed 34 civilians. December 28, 2014 was the third anniversary of what the Turkish collective memory bitterly recalls as the "Uludere incident." Fifteen months after the Uludere incident, the Turkish parliament's Human Rights Examination Commission approved a report drafted by a sub-commission assigned to examine the controversy over the killings. The Uludere report concluded that the investigations produced no evidence that the attack was intentional. The chairman of the sub-commission, an MP from the ruling Justice and Development Party [AKP], confused minds further when he explained the situation: "The report's finding that 'there is no evidence that the attack was intentional' does not mean 'the attack was not intentional.'" So, the air raid and subsequent killings were not intentional but maybe they were? In May 2012, an Istanbul prosecutor prepared indictments, carrying life sentences, of four Israeli commanders allegedly involved in the Mavi Marmara raid. They charged each of the commanders with first-degree murder, assault, and torture (the indictment called for 10 life sentences to be imposed on each of them). Immediately afterwards, an Istanbul court unanimously accepted the indictments and launched criminal proceedings against the Israelis. The military investigation report found that the Air Force killings took place due to "unavoidable mistakes" in the operation. Meanwhile, precisely 740 days after the unintentional/intentional killing of 34 villagers in Uludere, military prosecutors in Ankara dismissed the investigation into the incident. The military investigation report found that the killings took place due to "unavoidable mistakes" in the operation. It was bizarre; there were mistakes but, mysteriously, they were "unavoidable." Erdogan's government took a series of actions regarding the Uludere incident; none aimed at justice. Shortly after the killings, it won a court order to ban media coverage of the tragedy! On January 16, 2012, three Uludere/Roboski massacre survivors were taken to the prosecutor's office, under investigation for passport abuse, illegal border-crossing and smuggling charges. On June 28, 2012, hundreds of protesters, including families of the victims and NGO members, faced police violence at the site of the massacre. On December 25, 2012, police detained 19 individuals in and around Sirnak province, just four days before the anniversary of the massacre. Ferhat Encu, who lost 11 relatives in the airstrike, has been reportedly taken into custody at least four times. And on December 28, 2014, a crowd, including families of the victims, gathered to visit the cemetery in Uludere. Selahattin Demirtas, a pro-Kurdish politician, joined the commemoration. Three years after the incident, Demirtas was still calling on the Turkish government to find those responsible for the deaths. Not a single official has been found guilty by a court. "You have closed the file at the courthouse," Demirtas said. "But how will you close the file in the conscience of the people?" Good question. He further said: "These families will not give you peace until the suspects of this case face the judge ... We will not leave this world before we call those who held this massacre to account." Turkey is an increasingly bizarre country where a crowd of teenagers can be killed by rockets fired from warplanes, which the teenagers or their own families may have financed with their taxes. Where parliament finds that "the fact that there is no evidence that the attack was intentional does not mean it was not intentional." Where the military HQ finds that such tragic deaths could occur due to "unavoidable mistakes." And where courts ban media coverage instead of chasing down the guilty. The nine Turkish citizens killed aboard the Mavi Marmara remain so dear to the official Turkish memory. The 34 Turkish citizens killed in Uludere are mere casualties that the official Turkish memory wishes to forget. Turkey is not only discriminating against the living, but also against the dead.